Block Sun, Irritate Skin of Eczema Child? Posted byMei 21 December, 2011 22 May, 2018 5 Comments on Block Sun, Irritate Skin of Eczema Child? That’s something that parents seem to be very worried about and have reason to be as sunscreen lotion does contain several ingredients that are potential irritants. My baby Marcie uses Cetaphil and so far, it has worked well. But I have to confess that apart from applying before swimming, I don’t use the sunblock lotion since her eczema is triggered by heat so we’re seldom in the sun. Still, I did some research online and summarized for those of you who are looking into sunscreen lotion. What’s UVA, UVB and SPF? UVA rays can penetrate the skin and causes skin damage and aging; UVB, on the other hand, can cause sunburn. The lower the SPF number, the less protection against the UVB rays. Children should use at least SPF30 (SPF 30-59 is considered high) due to their delicate skin. SPF 30 means about 97% of the UVB rays are blocked. For babies, SPF 40 and above is recommended, though babies below six months should not even be in direct sun. 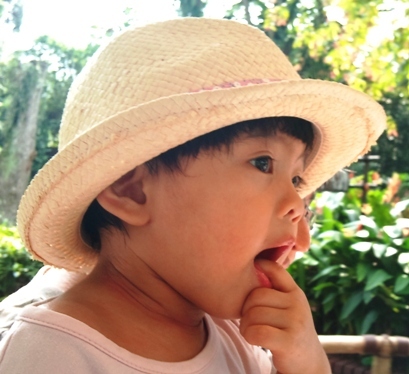 Apart from applying sunblock, your child can also wear a hat, thin but tightly woven white cotton, sunglass and use his/her favourite umbrella! Avoid going out from 11am to 4pm, where the rays are strongest. What Sunscreen Lotion to get? Sunscreen lotion are generally divided into two types – those that are chemical absorbers and those that are physical reflectors. Chemical absorbers penetrate the skin more and are more likely to irritate than physical reflectors, which reflect the UV rays from the skin. Physical reflectors are usually titanium dioxide/zinc dioxide based and the drawback is that they leave a white sheen on the skin (nano particles technology can reduce this white sheen but reported to increase risk of cancer; in particular, avoid spray-on and stick to cream/lotion). Also, stick to what you’d normally look out for in moisturizers – fragrance-free, preservative-free, lanolin-free, propylene glycol-free, PABA-free (para-aminobenzoic acid not only stains clothing but requires an alcohol vehicle to work), suitable for sensitive skin, hypo-allergenic, avoid ingredients like methyldibromoglutaronitrile, quaternium 15, benzophenones, oxybenzone, octinoxate, dibenzoylmethanes, mexoryl, retinylpalmitate, salicylates, octocrylene and cinnamates (I’m not sure if you can find one sunscreen lotion without any of these ingredients; the ones I listed first are what seem to be the more allergic ones). How to apply Sunscreen Lotion? First, test on a small part of the body, preferably inside of the arm. Wait for 24 hours to watch for any allergic reaction. 2013 update: Read my interview with Sonia Badreshia-Bansal MD (in collaboration with American Academy of Dermatology) on sunscreen. 2013 update: Read my interview with Dr Robin Schaffran on sunburn in this common summer skin rashes for kids series. 2014 update: Watch (or listen) to my Youtube slideshow on sun protection for kids. 2015 update: Read my interview with Dr Thomas Rohrer (in collaboration with American Academy of Dermatology) on how to treat sunburn. 2015 update: Skin (fun) facts! What’s the difference between normal, eczema and baby skin with regard to sun protection, find out here. If no issue with the lotion, apply moisturizer as per normal for your eczema child. 30 minutes later, apply sunscreen lotion. 20 minutes later, can go into the sun. Subsequently, apply every 2 hours particularly if contact with water or the child perspires a lot (even if the lotion says it’s water-proof). Apply even if in water as the cooling effect of water does not mean no sunburn. Lastly, make sure the sunscreen lotion hasn’t expired!